We've settled into a routine. Most Friday nights, Little Elvis and Baby Plum spend the night with my parents. Little Elvis says Fridays are special because he gets to spend the night with Gram and Coachpa. He looks forward to Friday night all week. And he seems to enjoy having Baby Plum around. My dad has a pile of dirt he's spreading around his yard. It's a bunch of fun for the boys. They even try to help him some when spreading it. 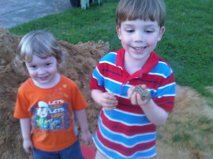 Little Elvis found a frog. Or maybe Gram did. I'm really surprised he's holding it. I don't know why, because he's not afraid of bugs and loves to talk about snakes. We went out to eat before they went to spend the night. Baby Plum ate most of his food, and was happy, though subdued. We got a free dessert, because they lost my order. It was a sample thing. 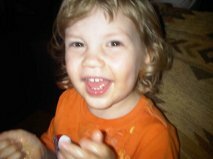 Baby Plum, though I'm pretty sure he was full, dug into the chocolate cake or mousse thing and ate the entire piece. I helped him with a fork for that since it was so messy. I took too long during one bite, and he leaned over and ate the whipped cream off the top. Little Elvis nibbled his meal, but did a good job with the ice cream part of the dessert. wow! what a special time for EVERYONE on friday nights. and, really- i don't blame him; i'd probly lick the whipped cream off, too. What an awesome tradition! 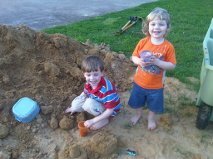 The boys *do* look really happy playing in that dirt pile! Very cool.